"Control and eradication of endemic infectious diseases in cattle" provides the key elements that should be addressed in the establishment of bovine disease control and eradication programmes. 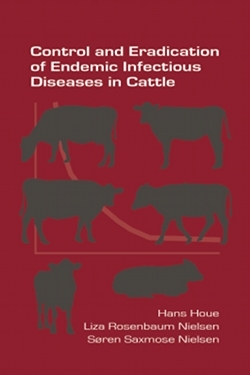 The book aims to reach a broad group of readers, including: students; professionals in veterinary practice, industry and governmental institutions; researchers; and others involved in control and eradication of endemic diseases in livestock. Key elements range from socioeconomic aspects such as motivation; veterinary science (including assessment of biosecurity and establishment of test-strategies); organisational issues such as resources, administrative and logistic considerations; along with other important aspects such as communication. The book addresses questions such as: Why is it important or relevant to eradicate a specific infection? What should be done to eradicate it? Which knowledge gaps still exist? Who should be involved and informed, and how should the programme be organised? Where should the programme be implemented? What measures should be used to monitor progress? When can we conclude that control and eradication have been achieved? The key elements are illustrated primarily using three examples: bovine virus diarrhoea virus, Salmonella Dublin and Mycobacterium avium subsp. paratuberculosis. The three authors have been particularly involved in the research and development of control and eradication efforts in the Danish cattle industry for these three diseases. The basic idea is to enable "disease profiling", which is governed by the characteristics of the agent and its interaction with the host and environment. This profile, along with due consideration of the socioeconomic circumstances, can be used to determine how best to address the problem.